The risks outweigh the potential rewards of owning these faltering dividend payers. Investing in dividend stocks is arguably the best way to predictably generate wealth over the long term. But not all dividend stocks are created equal. Whether it means avoiding businesses with unsustainable payouts or those operating in a faltering industry, buying and holding the wrong dividend stocks can have a devastating effect on the value of your portfolio. So with the aim of offering a few concrete examples to that end, we asked three top Motley Fool contributors to each discuss a high-risk dividend stock investors should probably avoid. Read on to see why they chose Frontier Communications (NASDAQ:FTR), Abercrombie & Fitch (NYSE:ANF), and Royal Dutch Shell (NYSE:RDS-A)(NYSE:RDS-B). Steve Symington (Frontier Communications): With Frontier Communications stock down nearly 40% over the past year as the telecommunications giant sheds subscribers -- the company ended last year with 91,000 fewer broadband subscribers, and 84,000 fewer video subscribers than it started in 2016 -- shares currently sport a huge annual dividend yield of 20%. That makes Frontier Communications seem enticing to value-seeking, dividend-hungry investors. But it also doesn't mean Frontier's share price can't continue to fall. And I don't expect its juicy yield to last much longer. I'm not the only skeptic. Late last month, shares declined as Goldman Sachs analyst Brett Feldman downgraded Frontier stock to "sell," speculating that the company may choose to suspend its dividend starting this quarter in favor of shoring up its balance sheet to address upcoming debt maturities. To be fair, that would probably be the most fiscally responsible move Frontier Communications management could make right now. Freeing up the funds allocated to supporting its payout could also help position the company to more easily return to sustained growth and consistently creating shareohlder value over the long term. But in the near term, I wouldn't want to be holding shares of Frontier Communications when the company formalizes this tough decision. And as such, I think investors would be wise to avoid this high-risk stock. Keith Noonan (Abercrombie & Fitch): Valued at 25% of trailing sales and packing a 7% dividend yield, Abercrombie & Fitch stock might look like a tempting purchase, but the company's shaky fundamentals and apparent lack of a workable turnaround strategy mean your investment dollars would probably be put to better use elsewhere. Sales for the company's Abercrombie brand fell 11% last year, while sales for the Hollister brand were flat compared with the prior year. Overall sales fell 5% last year and are down more than 26% over the past five years. With sales seemingly stuck in reverse, the company's main avenue to returning to profitability appears to be closing underperforming stores. Abercrombie shuttered 53 U.S. locations in 2016, and it has another 60 on the chopping block for this year. Closing lagging stores should improve margins, but it also underlines the likelihood that revenue erosion will continue. Abercrombie's appeal has always hinged heavily on brand strength, and now that the company's apparel is falling out of fashion and losing pricing power, the business could wind up in a tailspin if some form of reinvention doesn't happen. Its trailing free cash flow has fallen roughly 87% over the past five years, and there's good reason to doubt whether the company's payout is sustainable at current levels. The cost of distributing its annual dividend is nearly 125% of free cash flow, and with strong signs that the company will need to experiment and reinvest in itself to return to growth, its payout could soon be cut. Travis Hoium (Royal Dutch Shell): Big oil companies are in a really tough position today. They have to balance their short-term profits with investment in future earnings and still keep investors happy with dividends. At the same time, the price of oil has plunged over the past three years, and there's concern that new technologies such as electric vehicles will make the oil business obsolete over time. 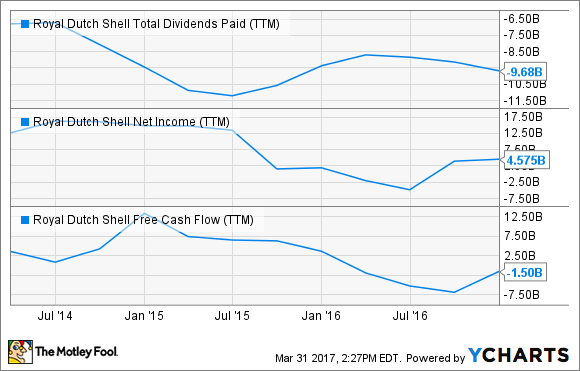 From a financial perspective, there's a reason I think investors should be very worried about Royal Dutch Shell's 7.22% dividend yield today. The first is that it's paying out more in dividends than it's making in net income or free cash flow. That means the dividend has to be funded by debt, putting leverage on an already struggling business. The other challenge is more long-term in nature. If Royal Dutch Shell is adding debt to pay dividends, it means it's making choices on what it's not investing in. As oil gets more competition from electric vehicles, and as renewables and energy storage become more cost effective, Shell could be playing a leading role in the energy future. But it's stuck paying a dividend that investors have come to rely on. And given the long-term struggles I see ahead for oil and the short-term challenge of paying out more in dividends than it's bringing in, Royal Dutch Shell is a dividend stock I would avoid.